Was Crooked Hillary Clinton wearing an earpiece during last night’s presidential forum? 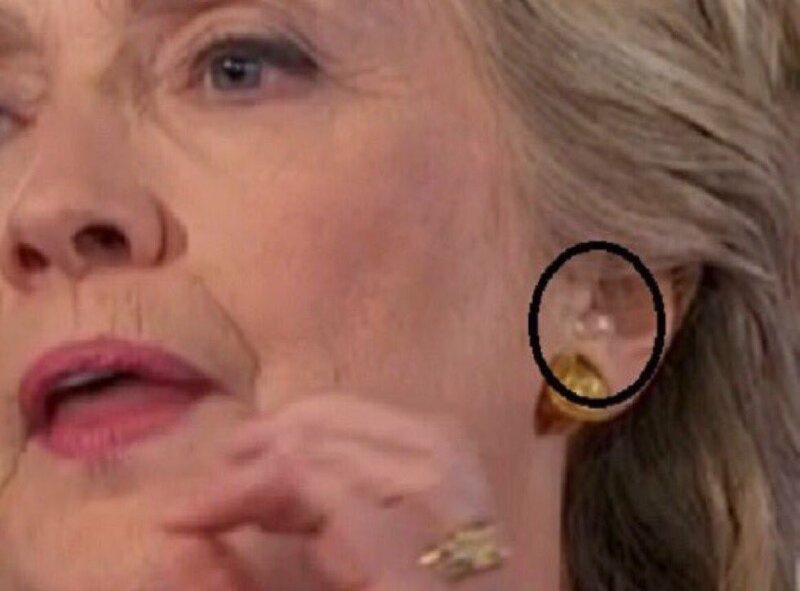 That’s the latest question swirling around the Internet after pictures appeared to show Hillary with some kind of flesh-colored device embedded inside her ear. Crooked Clinton spokesman Nick Merrill said what is seen in the photo is "merely a reflection of the TV lights or a flash,” The story also drew almost a thousand comments over on The Donald subreddit, with one user commenting, “Either she admits a health issue and says she’s deaf or she admits to cheating.” A Trump supporter said. “I commented earlier during the Town Hall saying her responses seemed a little slower than normal. Now it all makes sense,” responded another. Internet detectives are trying to figure out what the hell Crooked Hillary spit in her water cup Monday while suffering a debilitating cough attack on stage in Cleveland. While the “mysterious green substance” that falls out of her mouth appears to be a couple of throat lozenges, others around the web theorize it could be “alien mucus,” “demon blood,” or “the devil trying to get out.” But, some internet detectives thats studied the footage say the glass of water was not for drinking, it was for spitting. In front of her 87 supporters and thousands of Donald-Trump Trolls texting: “COUGH” and “CHOKE” in the live chat-stream, old phlegm-filled Hillary coughed a green loogie into a clear water glass on live TV! Hillary Clinton spoke to a crowd in Kissimmee, just south of Orlando. She was supposed to be talking jobs, but started the speech off paying tribute to those affected by the Pulse Nightclub shooting. "I know how many people, families, loved ones, and friends are still grieving, and we will be with you as you rebuild your lives." 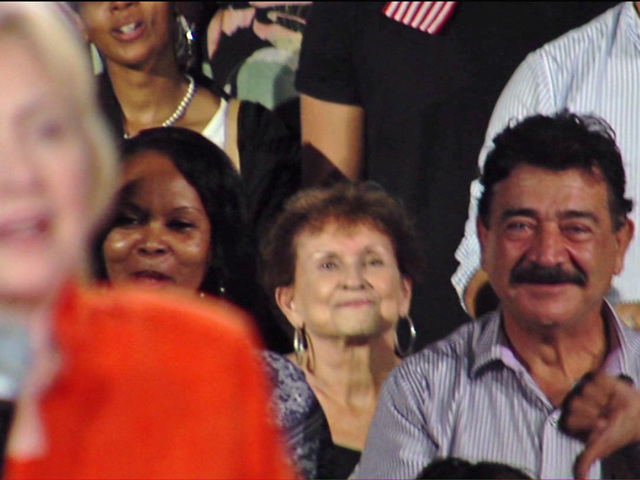 WPTV happened to notice the man, who has a mustache and was wearing a red hat, behind Clinton. It was Seddique Mateen , the father of Orlando mass shooter Omar Mateen who killed 49 people. NewsChannel 5 asked Mateen what he was thinking about when Clinton spoke about the Orlando incident. "Hillary Clinton is good for United States versus Donald Trump, who has no solutions," he said. 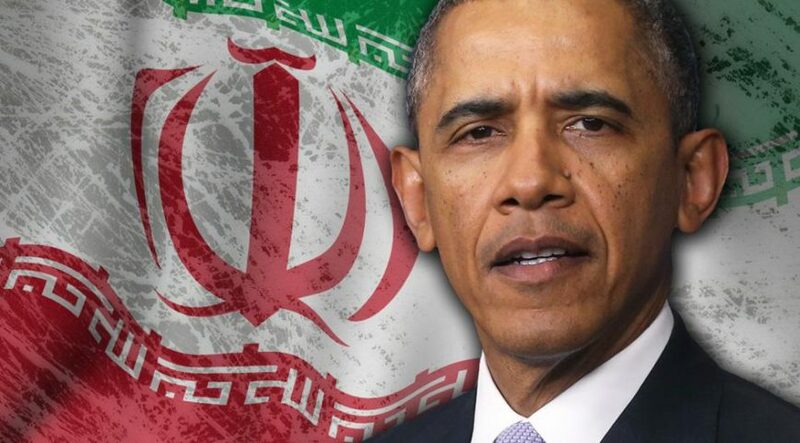 The Obama administration secretly organized an airlift of $400 million worth of cash to Iran that coincided with the January release of four Americans detained in Tehran, according to U.S. and European officials and congressional staff briefed on the operation afterward. Wooden pallets stacked with euros, Swiss francs and other currencies were flown into Iran on an unmarked cargo plane, according to these officials. Senior U.S. officials denied any link between the payment and the prisoner exchange. They say the way the various strands came together simultaneously was coincidental, not the result of any quid pro quo. 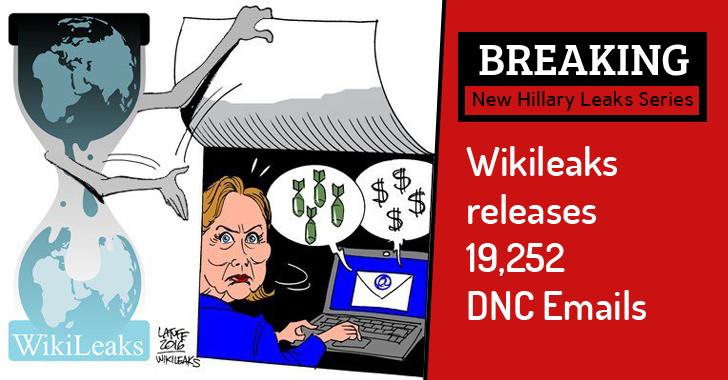 The Democratic National Convention was sent into upheaval over the weekend when Wikileaks released nearly 20,000 internal emails from the party — some of which showed officials working against Sen. Bernie Sanders in the primary. US officials suspect the email dump is the work of Russian hackers who were discovered in DNC servers earlier this year, and experts believe the coordinated release of the documents on the eve of the convention are an effort by Moscow to meddle in the US presidential election. Here’s what you need to know about the leak. President Obama says Hillary Clinton “could not have been more diligent” as secretary of state in a video her campaign released mere hours after FBI director James Comey accused her of being “extremely careless” in her handling of classified materials during her tenure. As FBI Director James Comey let Clinton off the hook for her "extremely careless" actions, the fix was final. The Obama Administration's anointed successor has had an indictment removed from her path, and will now be able to glide to the rigged Democrat nomination. 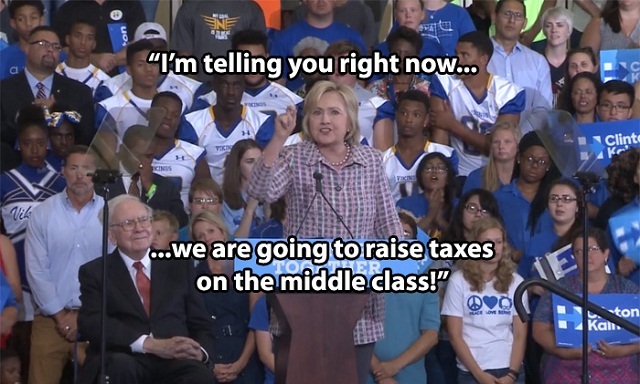 As we move toward November, the question now becomes, "what is Hillary hiding?" The Obama administration is betting on a stealth plan to secure final passage of the massive Trans-Pacific Partnership, or TPP, before Obama leaves office by pushing the bill through Congress in the “lame duck” session between Election Day Nov. 8, and Jan. 6, 2017, the date the new Congress is sworn in, despite growing voter opposition that now has Hillary Clinton joining Donald Trump in opposing the bill. Tactically, the Obama administration has decided to postpone a TPP vote until after the election, concerned that pushing TPP passage now would risk damaging Clinton’s chances, given her enthusiastic support for TPP during her tenure as secretary of state.